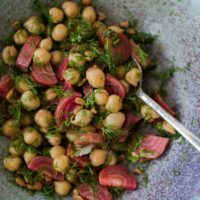 A fresh, spring-feeling salad featuring roast chioggia beets tossed with chickpeas, dill, and lemon. A lovely side for dinner or a great picnic salad. Preheat oven to 425˚F. Trim the beet tops and ends if long, if necessary. Place in the middle of a piece of parchment and toss with the olive oil and salt. Fold the parchment paper up and create a sealed package (I usually fold the top part together a couple of times then tuck the sides under. Place the parchment packet in a roasting pan. Roast the beets until tender, 35 to 55 minutes (will depend on the size of each beet). Remove from the oven and let cool enough to rub the skin from the beets. Once the beets are peeled, cut into 1/2″ thick wedges and place in a bowl along with the cooked chickpeas, dill, and sunflower seeds. Measure in the olive oil, lemon juice, salt, and pepper. Toss until well combined. Taste and adjust salt as needed. This salad can be eaten immediately but does taste a bit better if allowed to rest for an hour or so. Tips + Tricks: Roast the beets up to 24 hours ahead of time. The longer the beets cool, the easier it is to rub off the skins.